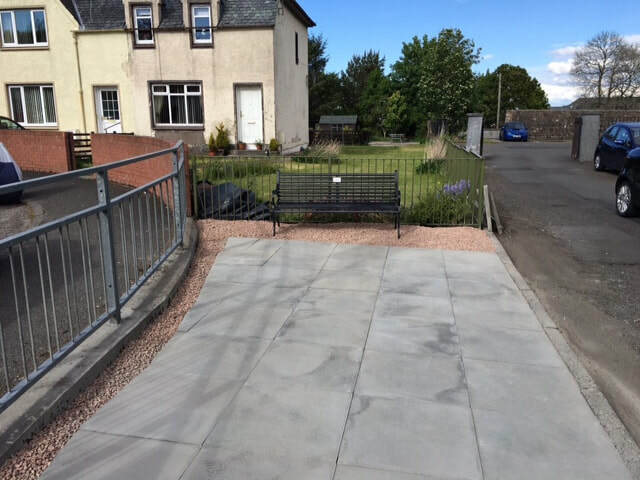 Past Projects - Eaglesham T.R.E.E. ​We decided earlier this year to plant The Townhead Bed (at the junction of Polnoon Street and Montgomery Street) with a good percentage of permanent planting. This will give better colour and interest throughout the year, be good for beneficial insects and will be less labour intensive. 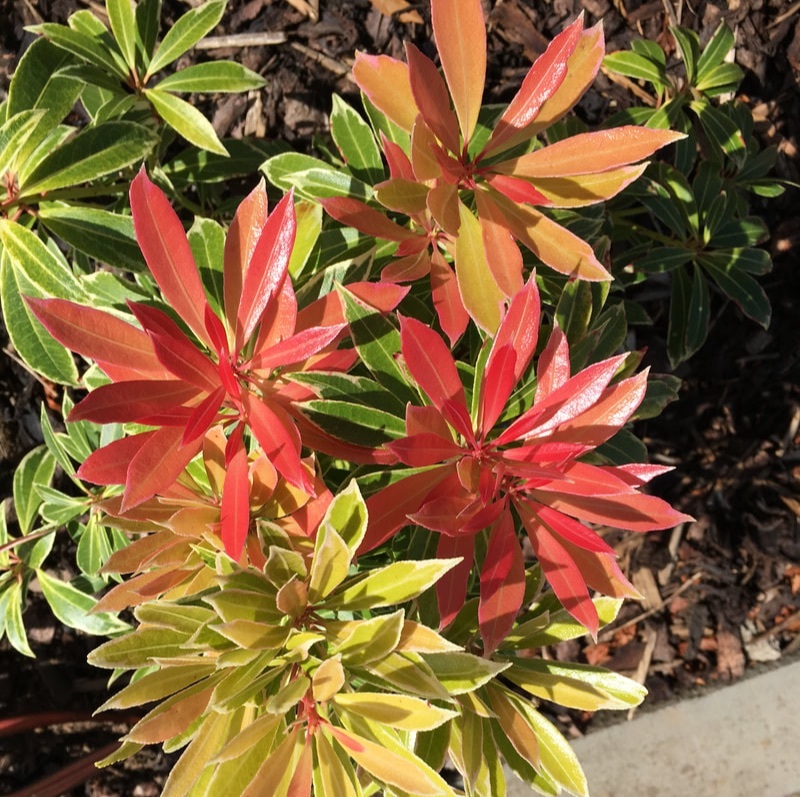 The permanent planting will be augmented with seasonal bedding plants to give extra colour. 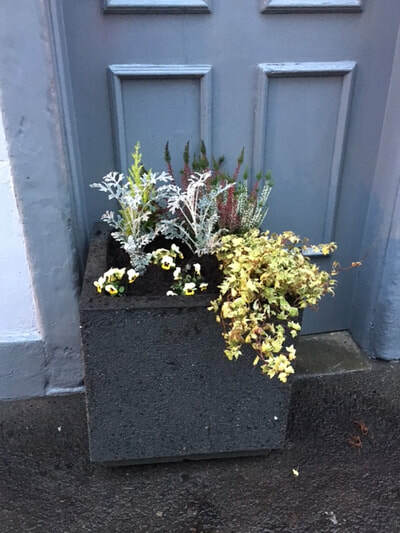 The winter flowering heathers and the 3 large Hebes incorporated in the design have all been re-homed from various planters which they had outgrown. ​In the spring, before the Geranium 'Roxanne' comes into growth, the daffodils will give us a burst of golden sunshine. 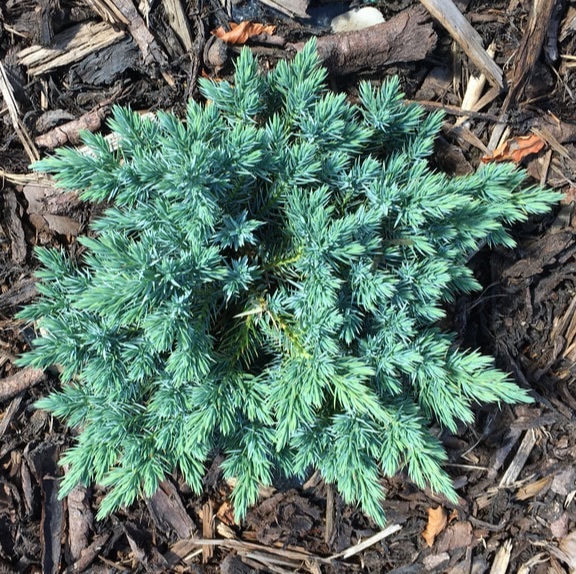 Some of the perennial plants included in the scheme are listed here. 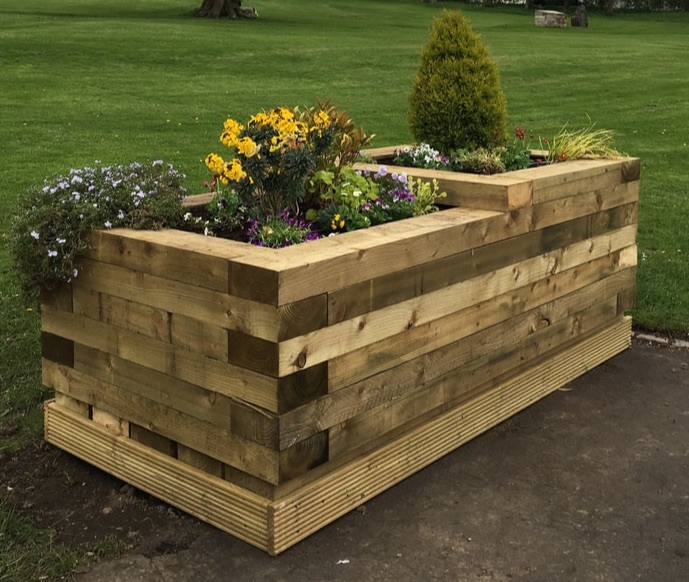 Completion of the installation of two new wooden planters. The old planters were emptied and re-homed. Thanks to Eaglesham Memories Calendar, Andy Kirkland and Gordon, and MacTaggart and Mickel. A huge thanks to the Eglinton Arms Hotel for so generously donating the dinner for 100. The evening was a resounding success and all proceeds have gone to fund past and current projects. ​Thanks to all the residents, friends and families who supported the event. 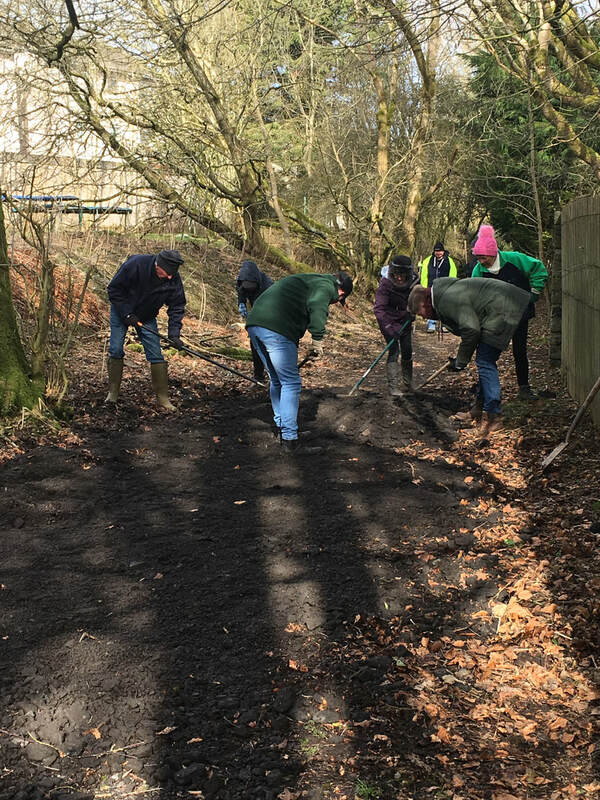 In excess of 30 tons of scalpings were laid in Coo Lane to stabilise and resurface the path which had become boggy and waterlogged. 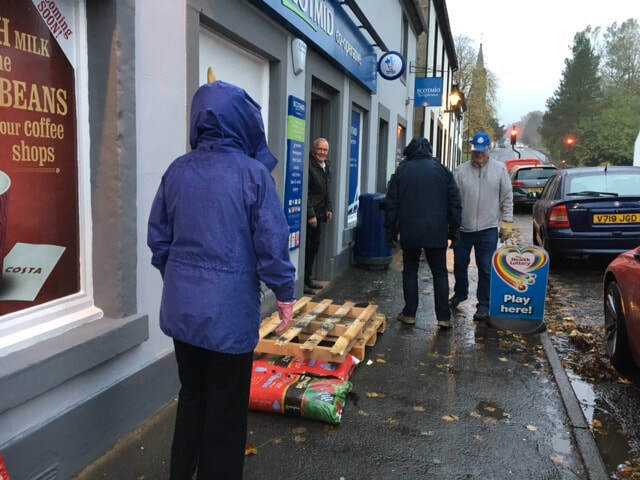 Thanks to Jim McLean, Dougie McWhirter, Andy Kirkland and all the many volunteers from around the village and Waterfoot who lent their muscle power! Robert Young and Alan Hay who compile the Eaglesham Memories Calendar, were kind enough to donate all the proceeds from the 2018 version. 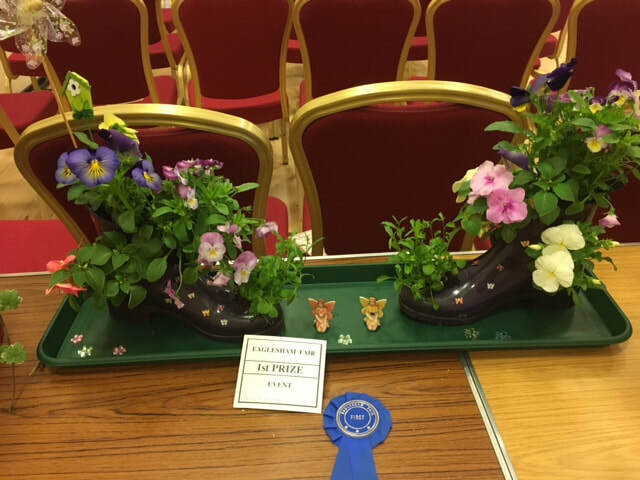 We were very grateful to be selected as recipients and the money raised funded the much admired planters and other expenses. 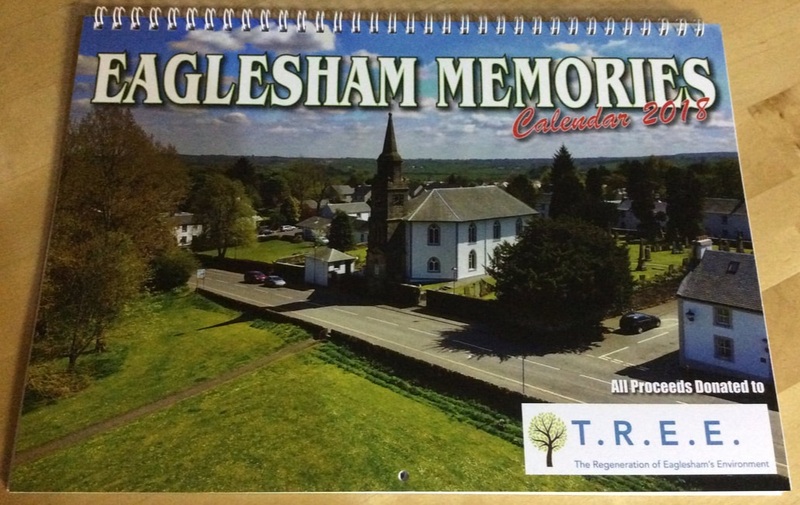 We would also like to recognise the part played by The Village Gift Company in selling the calendars. We couldn't have done it without them! 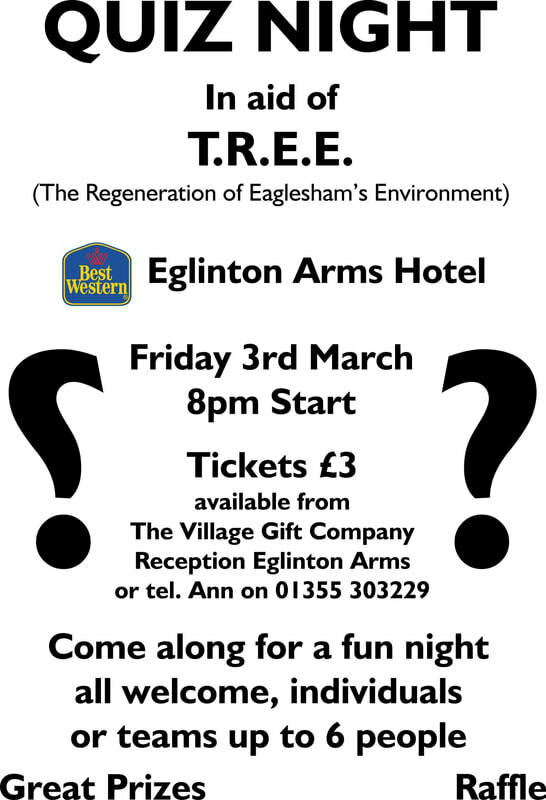 Fund-raising Quiz Night at the Eglinton Arms Hotel. Click to see more photos of the Quiz Night. For a number of years T.R.E.E. 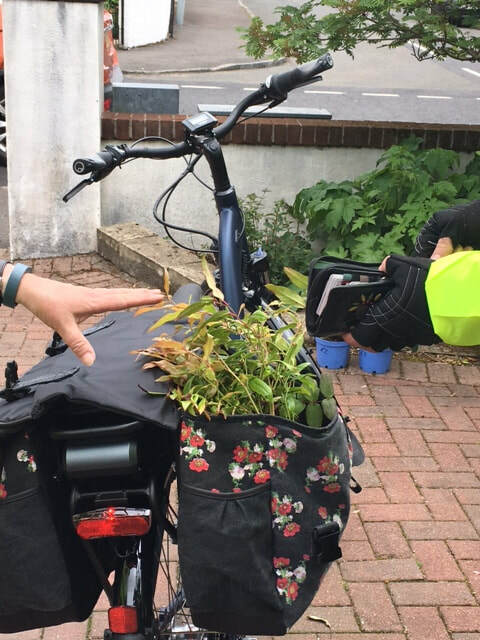 have held regular work parties on Thursday mornings to maintain planters and weed or tidy areas around the village. T.R.E.E. 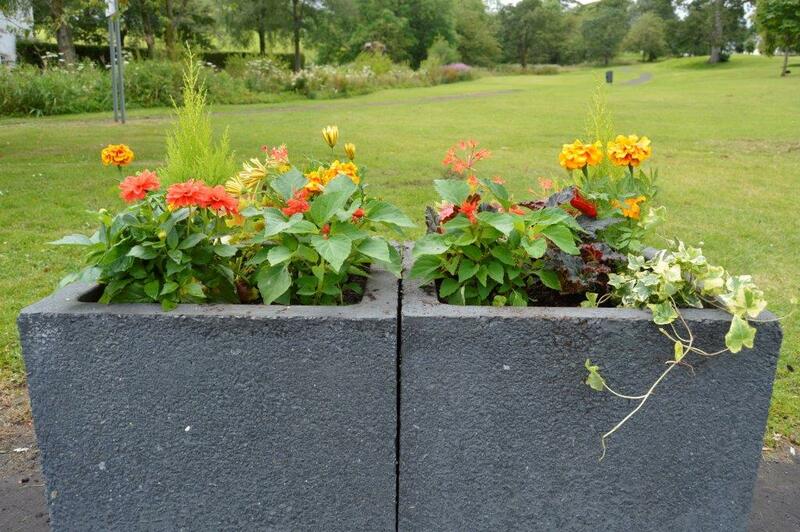 have paid a contractor to cut and maintain common ground opposite the shops and the Humbie Road/Glasgow Road verges. 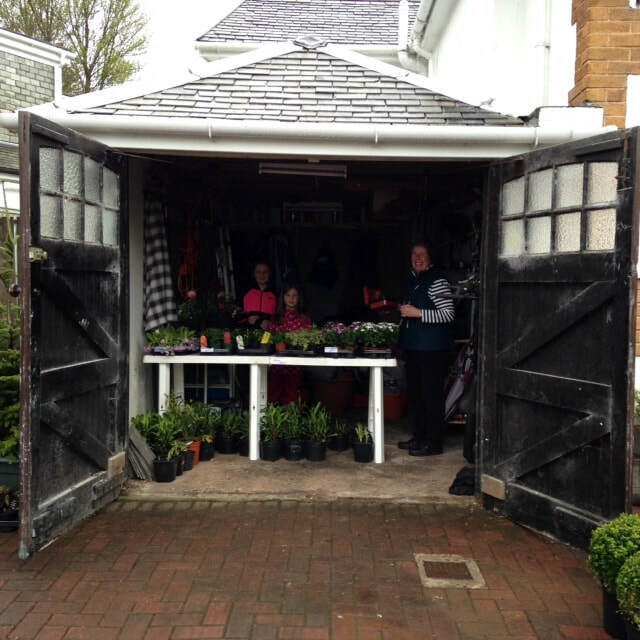 Plant sale to sell off plants which had outgrown their planters and to raise funds. T.R.E.E. took part in the Eaglesham Fair parade for the first time, and manned an information table. T.R.E.E. ran competitions for adults and children. 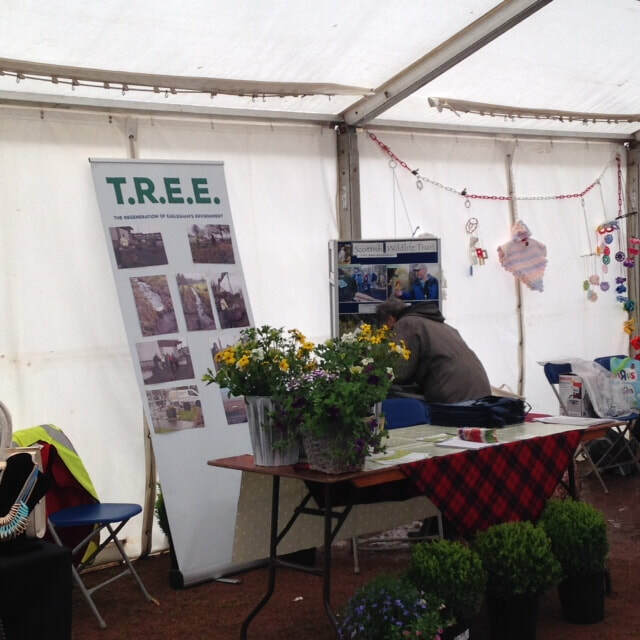 Click to see more photos of Eaglesham fair. T.R.E.E. volunteers emptied planters at library of all plants and compost to ready site for slabbing works. New bench delivered and installed at library site. 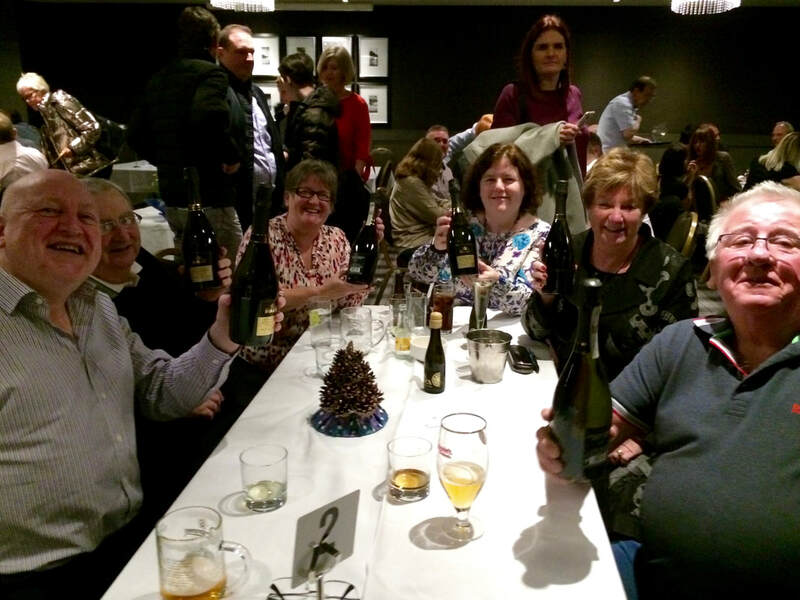 Fund-raising Quiz Night at the Eglinton Arms Hotel. A sell out (120 tickets sold) and a resounding success! 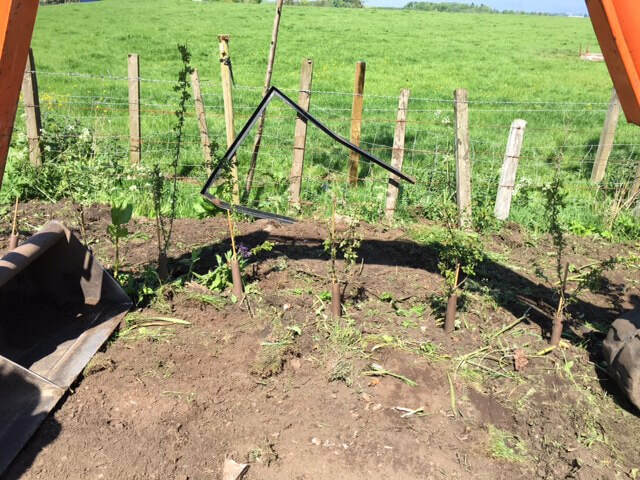 150 Crataegus whips, generously donated by Euan Weir, planted in hedge line at the corner of Glasgow Road and Humbie Road. The Council then re-seeded the area. 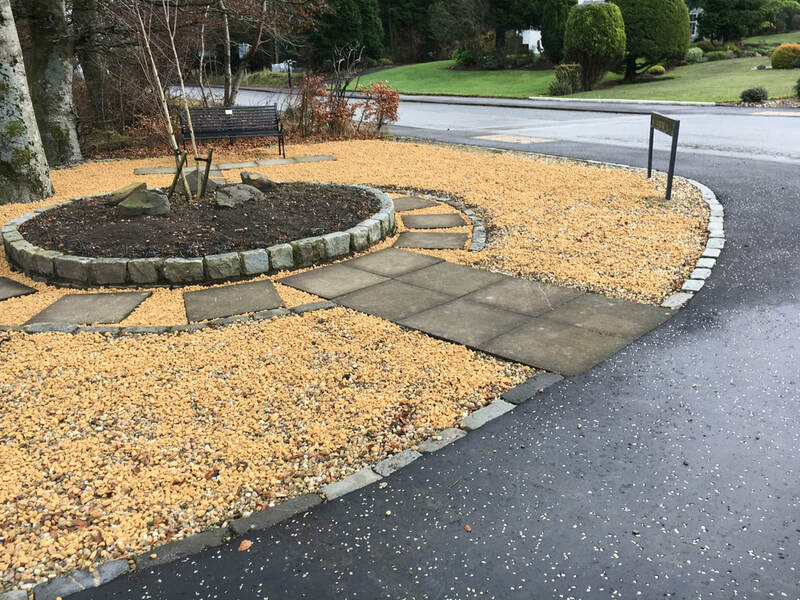 2 tonnes of golden quartz gravel laid at the top of the Orry beside new benches. Alba Landscapes removed and replaced all the broken slabs at the top of the Orry. 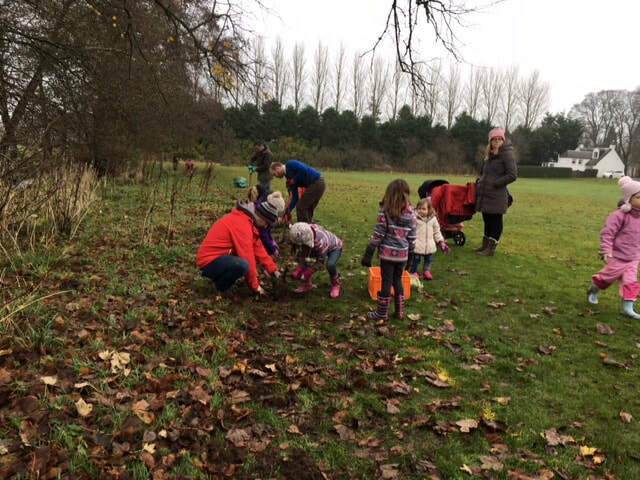 Community daffodil planting. Bulbs donated by ER Council, and Tenby Daffodils (Narcissus obvallaris) ​ bought by T.R.E.E. Potted up Crocus bulbs with the Brownies. 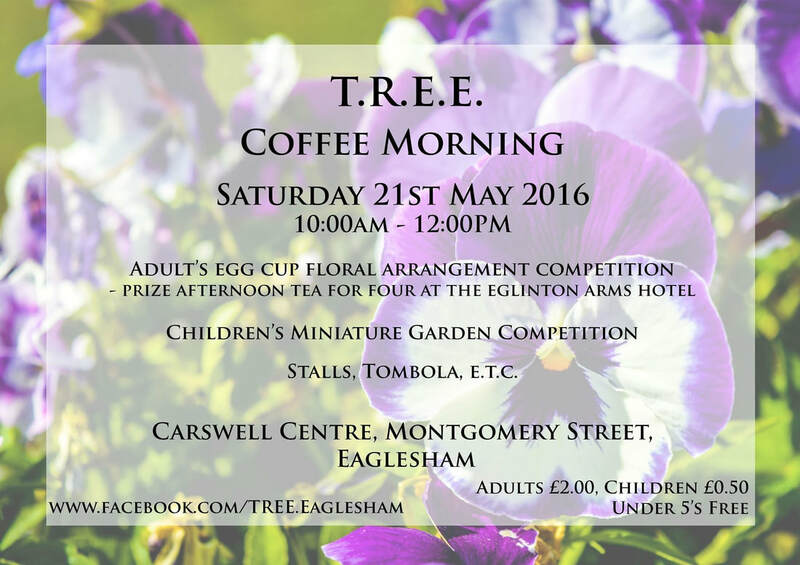 Coffee Morning/Plant Sale held by T.R.E.E. to raise funds. £2000 AOE grant awarded to T.R.E.E. Official opening of the bus shelter. 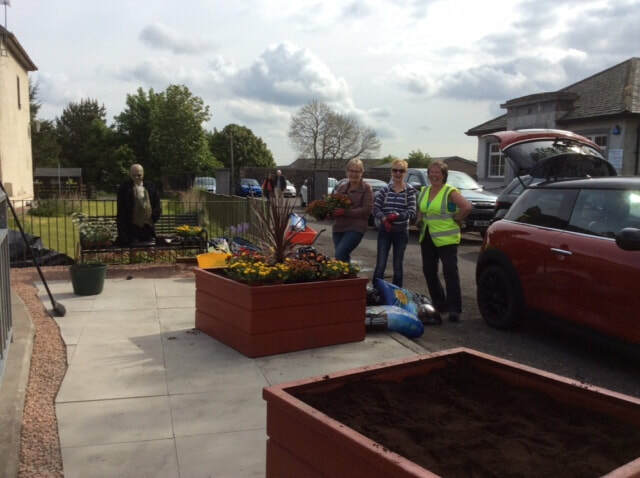 Opened by Provost Carmichael, who has been a supporter of our group, and attended by the school children, parents, teachers and the local community who assisted. 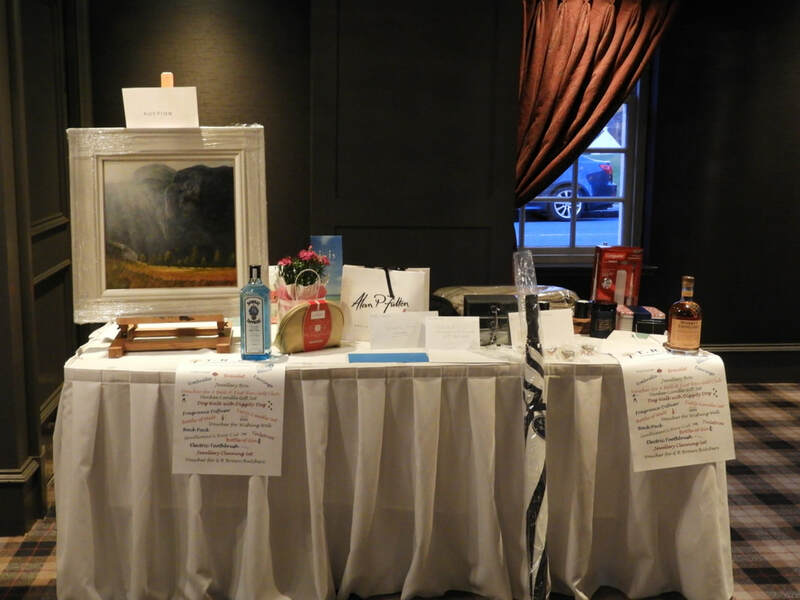 The reception after the opening was donated by and held in the Eglinton Arms Hotel. 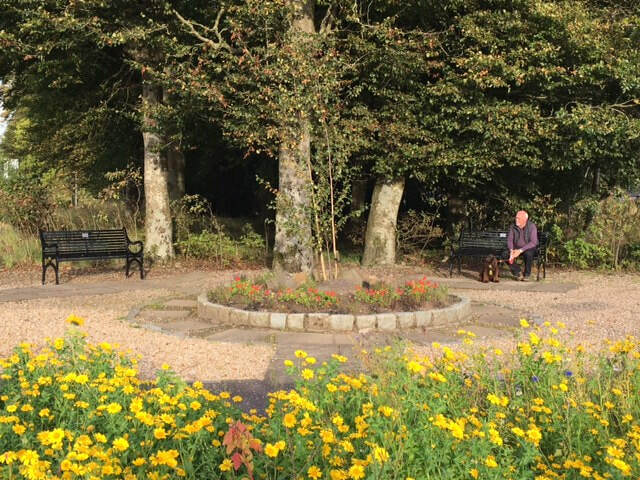 After clearing the area, a multi stemmed Betula jacquemontii and spring flowering bulbs were planted in an existing cobbled circle at the top of the Orry. In the following weeks many volunteers turned out to help reclaim the pavement at the top of Montgomery Street. The area had been neglected for years which had caused a build up of leaf litter, weeds, broken branches etc. 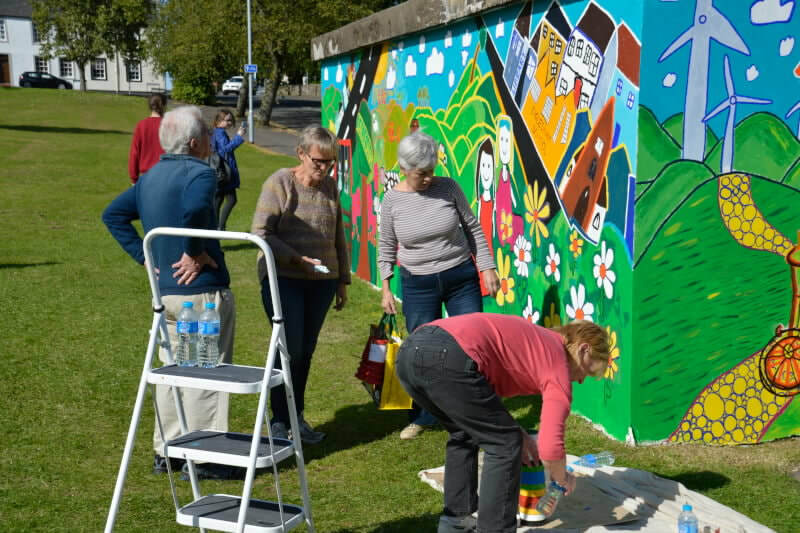 Painting of the mural on the bus shelter at the Eglinton Arms Hotel in conjunction with 2000 daffodil bulbs being planted. 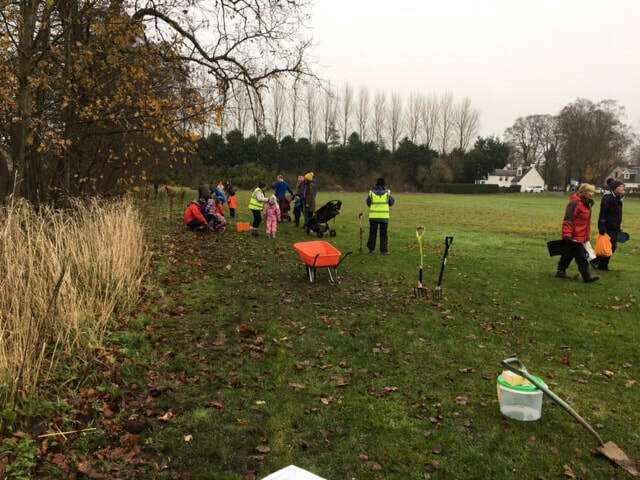 Bulb planting was open to the whole community. Prize giving for the 10 primary school pupils whose work was chosen to go into the mural. The prize giving was held in Eaglesham Library and all the winning art work was on display in the library for a week. 5 members of the Boys' Brigade started clearing Coo Lane, a public right of way, of rubbish and overgrown weeds. The boys were working towards their Queen's badge and each of them contributed 30 hours over a period of several weeks. In excess of 200 bags were filled by the boys and then uplifted by ER Council. 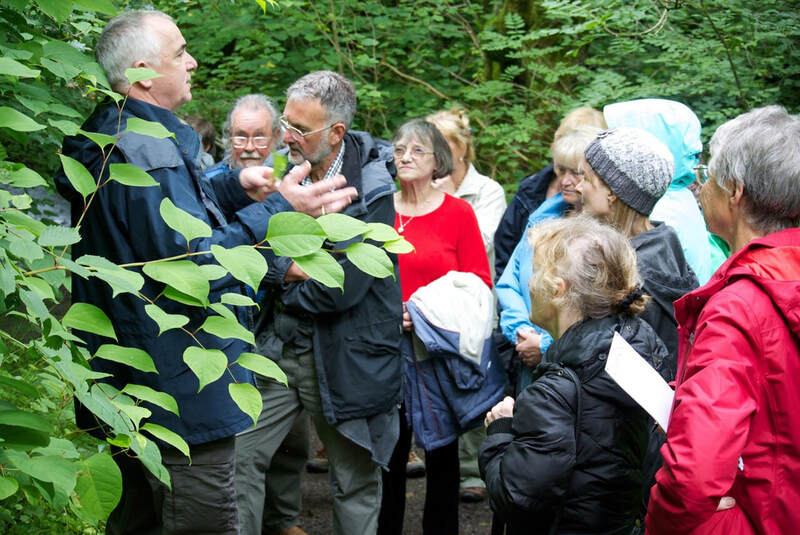 Wild flower walk round the Orry led by Kenneth Watson, a retired lecturer in Horticulture. This event was open to the whole community. Bus shelter beside the Eglinton Arms Hotel re-rendered and painted white by MacTaggart and Mickel as a donation to the community. Table taken at Eaglesham Fair to raise awareness, recruit volunteers and to fundraise. ​During the week running up to the Fair, Eaglesham library put on an exhibition of all the artwork submitted for the bus shelter mural. Orry clean up. Cleared all dead plant matter from the burn beside the Eglinton Arms Hotel. Removed fallen trees from the burn. 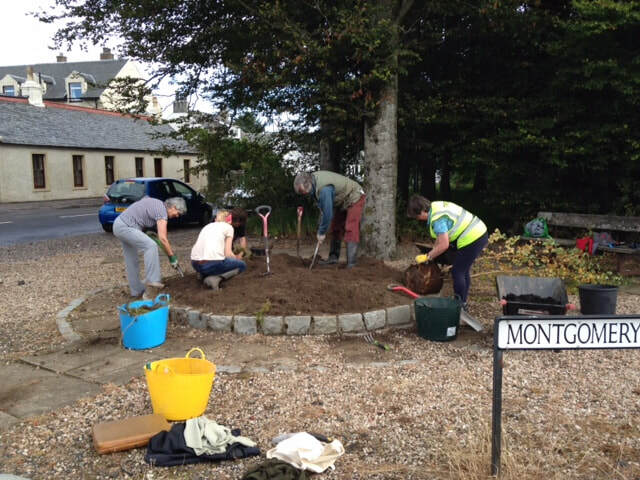 Graeme Crichton of Alba Landscapes 'donated' 2 of his workers for 6 hours and they worked alongside other volunteers. T.R.E.E. wrote to all local primary schools inviting them to participate in a competition to design a mural for the bus shelter at the Eglinton Arms Hotel. Local secondary schools were invited at the same time to help in implementing the design. Eaglesham Primary School and St Ninian's High School both wished to take part in this community event. 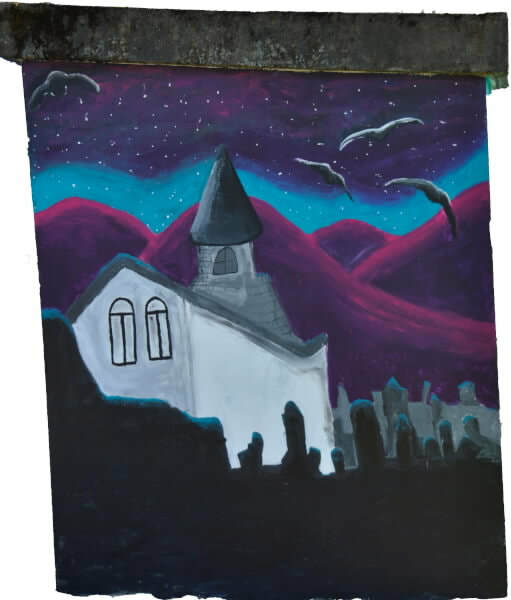 Click to see more photos of the pupil's designs. 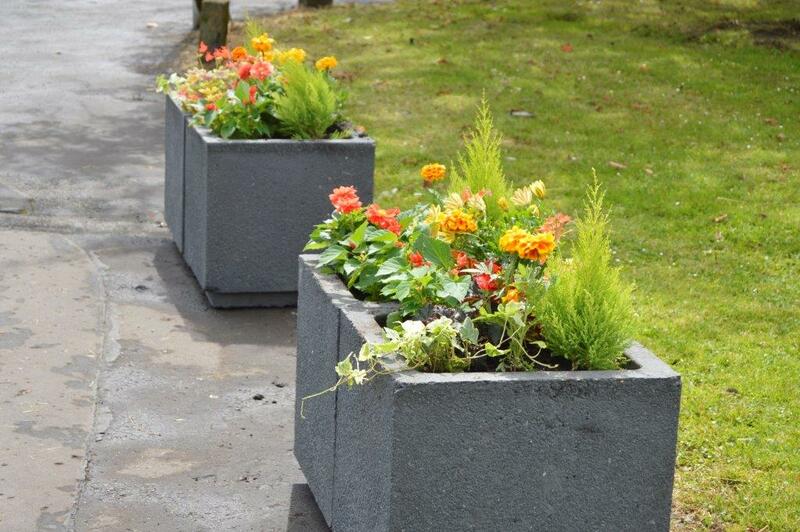 Planters planted with Sorbus hupehensis, evergreen shrubs and spring flowering bulbs. Two trees, Sorbus hupehensis, planted and staked in cobbled circles at top of Alexander Avenue. Whole area weeded, swept and tidied. ​Three trees, Sorbus aucuparia 'Edulis', planted and staked at corner of Glasgow Road and Humbie Road. 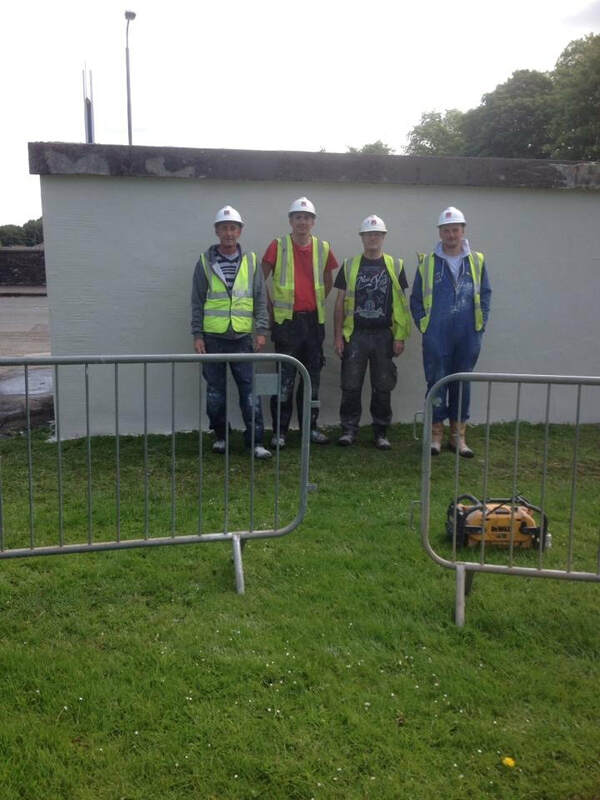 All works carried out by volunteers. 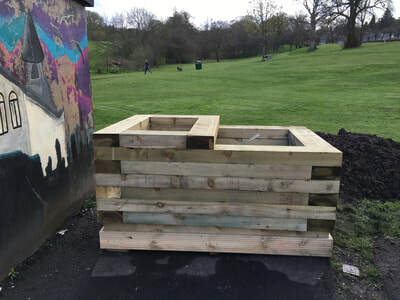 Drainage pipe 'planters', donated by MacTaggart and Mickel, delivered to area beside shops at top of Alexander Avenue. 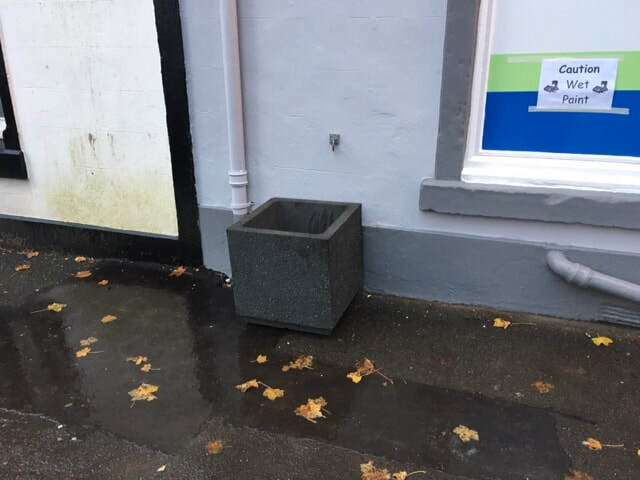 8 planters, purchased from Marshalls, delivered to 3 sites in the village, filled and planted. Slabbed bases were installed prior to planters being sited. Area adjacent to pavement, across from Glasgow Road shops, tidied, hedge trimmed and Vinca minor and spring flowering bulbs planted. 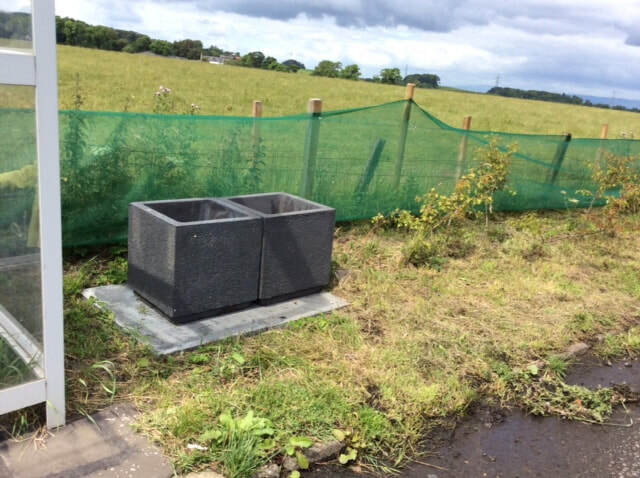 Protection erected at corner of Glasgow Road and Humbie Road to screen hedge until it is established. 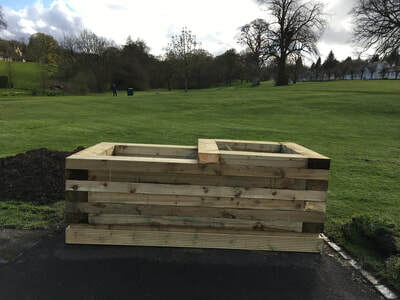 300 bare root Crataegus laevigata purchased and planted at the corner of Glasgow Road and Humbie Road to fill in the gap between existing established hedges on the aforementioned roads. A few surplus plants were planted shortly thereafter in a gap in the hedgerow across from Scotmid. 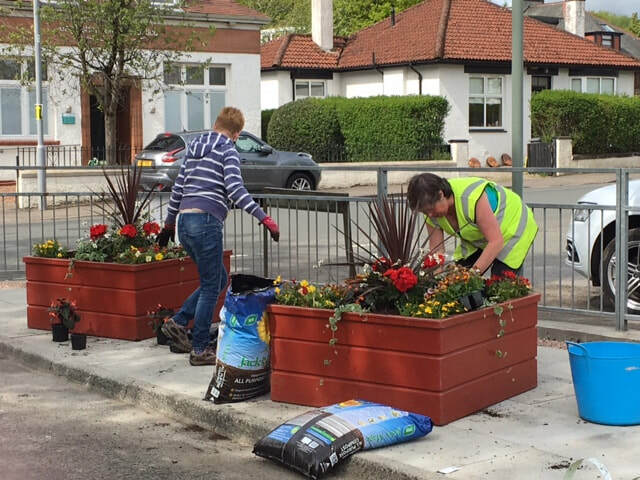 Turf removed from grassed area across from the Glasgow Road shops and several hundred spring flowering bulbs planted. 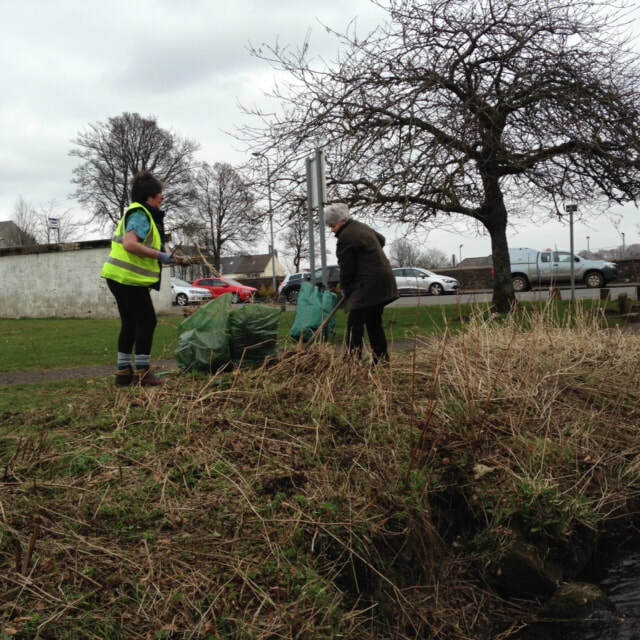 Litter cleared, areas tidied and snow drops planted in various sites round the village, mainly around the bus stops. Fundraising Enid Reid night. £206 raised. Awarded an £8000 grant by the Whitelee Wind Farm Fund Panel for environmental projects in Eaglesham. Fundraising coffee morning. £1400 raised. 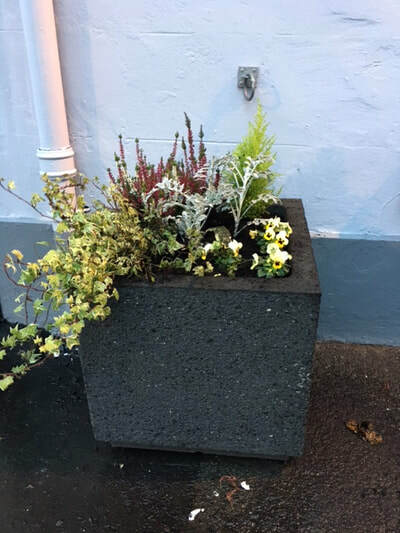 ER Council donated 2 fibreglass planters and 10 wooden planters to T.R.E.E. All had been used previously by the Council and were surplus to requirements. 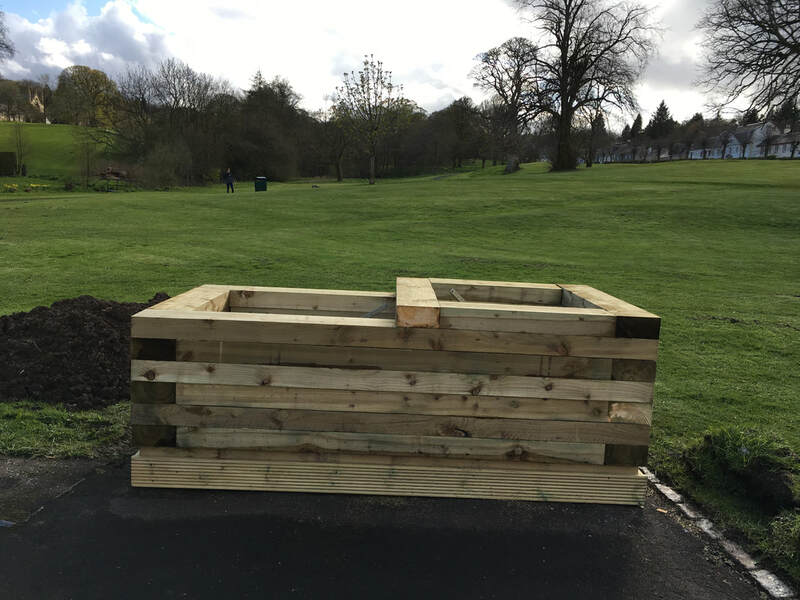 Wooden planters were in the training centre based in Rouken Glen. Volunteers cleaned, sanded and applied a wood treatment to enhance the appearance and protect the wood. 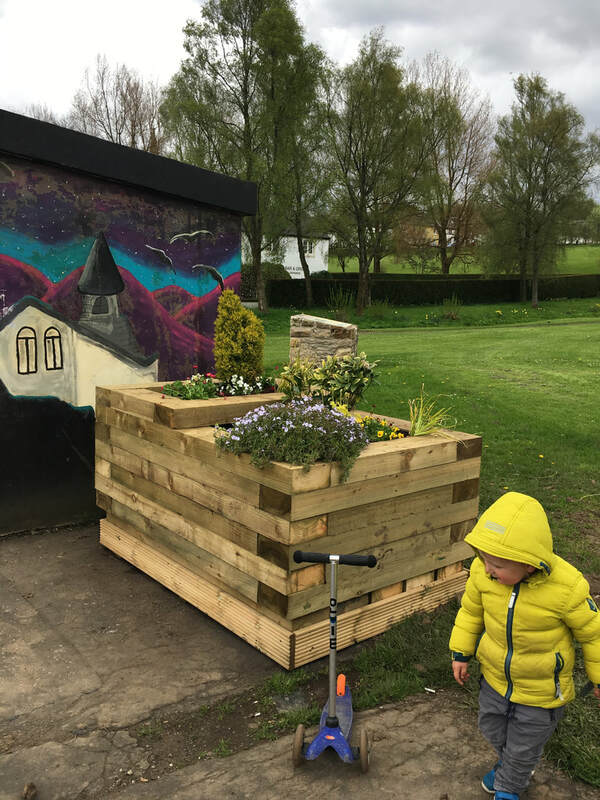 The wooden planters were repainted in summer 2015 by a local painter and decorator on a voluntary basis. ​200 plus tattered tree guards removed by T.R.E.E. volunteers from trees planted a considerable number of years ago.